The big shoemakers are not blind to the cost of retailing their wares. 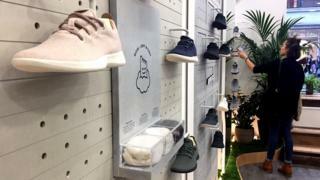 Allbirds, which has just opened a store in London’s Covent Garden, has been one of the companies that has benefitted from that trend. “The fact that no-one’s tethered to a desk means that their wardrobes are not tethered to an office environment and that’s driven a change in wardrobe that makes everyone less formal,” Joey Zwillinger says. If you are wearing trainers now, take a look at them. Are they made of several pieces of fabric stitched together? That’s the traditional way of making the upper part of a shoe and it’s labour-intensive. Shoemakers have been introducing upper parts that can be knitted as one piece and then joined to the sole. Half of Allbirds’ shoes are made this way.